Bruno is brash, buoyant, impulsive. He leaps into everything without thinking, he’s cheerful, likable, obnoxious. When we first meet him he’s zooming around a silent shuttered Rome in August; it’s a ghost town, everyone is gone already on vacation. He drives a sporty lancia aurelia, he drives fast and carelessly, even his horn is cheerful and obnoxious. He sees Roberto staring out his window and he calls up to ask a favor–will he make a phone call for him? Roberto invites him up to make the call himself. With the anxious self doubt of a man who spends a lot of time alone, he second guesses his decision to help, but assures himself that it will be okay. Next to Bruno, Roberto seems small, pale, quiet and serious, but somehow they hit it off, and Bruno persuades Roberto to go for a drink with him so that he can repay his kindness. What follows is the road trip at the center of Il Sorpasso, Dino Riso’s beautiful Commedie all’italiana starring Jean-Louis Trintignant and Vittorio Gassman. The heart of the film is the unlikely friendship between Bruno and Roberto. On the surface it seems like a morality tale: light and dark, angel and devil, the moral man tempted by the immoral man. But it’s far more complicated than that, and this is what makes it more honest and beautiful. Bruno, affable and social, has an easy way with people. He’s friendly and flirtatious, and he impresses Roberto with his schemes to seduce many of the women they meet. But he always fails to do so. He’s alone at the beginning of the film, and alone again at the end. And he’s surprised by Roberto’s flashes of humor and insight, by the strength of his personality, though it be quietly expressed. As the story of their friendship unfolds, through the streets and cafes and nightclubs of 1960s Italy, the camera lingers on other people all around them. Not fleetingly but thoughtfully, a real wondering pause that treats the characters not as extras but as people with fascinating stories of their own, which we could discover if only we chose to follow them instead of Bruno and Roberto. Many times throughout the film Roberto nearly leaves Bruno, to make his own way back to Rome. But he always stays in the end, and they develop almost a brotherly relationship. They talk about keeping in touch when they return to Rome, and you wonder if it would actually happen. Bruno plays and talks and sings, Roberto watches and thinks, and they speed along the Via Aurelia, passing everyone in their way. Beets and sorrel! They just make sense! One is tart and bright, one is sweet and earthy. 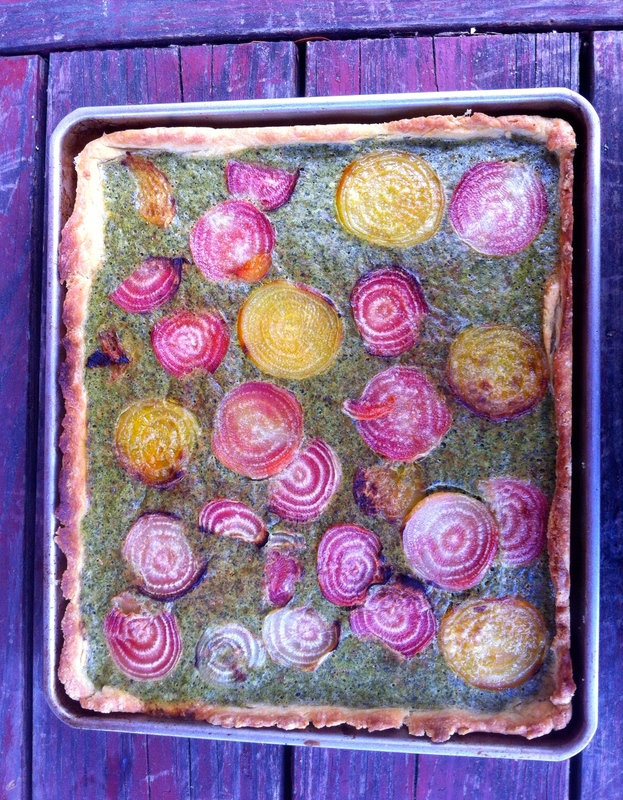 I decided to combine them in this tart, which also uses the beet greens and a handful of other fresh herbs. The beets (from Sandbrook Meadow farm) are so pretty, I just sliced them and roasted them and scattered them on top of the tart. The crust has a little cornmeal in it for extra crispiness. My oven is still broken, so I actually cooked this in the toaster oven on the toaster tray!! Here’s Peppino di Capri’s Per Un Attimo. Combine the flours and salt in a bowl. Grate in the butter and mix with a fork till everything is coarse and crumbly. Add just enough ice water to pull everything together into a workable dough. Knead for about a minute to make sure everything is combined. Roll into a ball, flatten, wrap in foil and store in the fridge for at least half an hour, or until you’re ready to use it. Preheat the oven (or your toaster oven!) to 425. Slice the beets across in 1/8th inch slices. I used my food processor, but you could do it by hand. Toss them with just enough olive oil to coat. Arrange in a single layer on a baking tray and roast until soft and starting to brown, about 20 minutes. Turn frequently to brown both sides. Set aside to cool. Lightly butter a tart pan and roll the dough out to fit, pressing it up the sides. Prick the bottom with a fork. Bake in the preheated 425 degree oven for about five minutes, until it starts to lose its shine and you’re sure it won’t collapse on you. If the edges sag press them with your fingers or a spoon to build them up again. In a medium-sized pot boil or steam the beet leaves until wilted but still bright, about five minutes. Run under cool water and chop. Warm the olive oil or butter in a large skillet over medium heat. Add the garlic and stir and fry until it starts to brown. Add the sorrel and beet greens. Stir and cook until they’re coated with olive oil and quite soft. You want the pan to be quite dry, but if the greens start to stick add a spoonful of water. Set aside to cool. In a food processor or blender combine the milk and eggs and herbs and blend until frothy. Add the cheese and blend until it’s well-combined. Add the sorrel and beet greens and blend until the batter is flaked with green, but not completely smooth. Pour this into the prebaked shell. Arrange the beets prettily on top. Bake until puffed and golden, about 20 to 25 minutes. Let cool slightly, slice and serve. 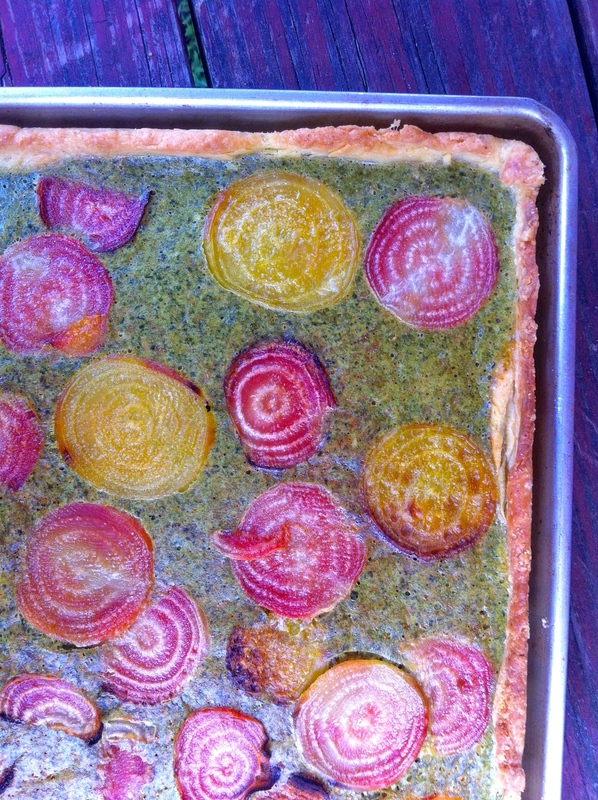 This entry was posted in basic pie filling, crust, recipe and tagged beet and sorrel, beet tart, cornmeal crust, roasted beets, sorrel tart by Claire. Bookmark the permalink.